Lazy and incompetent, Jeff is actually one of the better comedic characters of the genre. Jason Segel has always amused and entertained me in the past, but who knew he could really act? In one of the scenes that sets the stage for the film, and Jeff’s journey, has Jeff sitting on the couch watching a shopping channel. If he calls now, as the salesman encourages him to, he can start the next chapter of his life. Jeff is definitely thinking about, and then the phone rings. The look that crosses his face is priceless and comforts you as you realize you are settling in for one really good film. 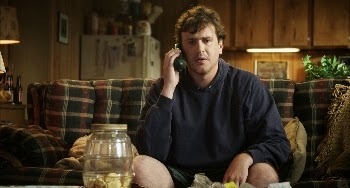 Jason Segel plays Jeff in JEFF, WHO LIVES AT HOME, from Paramount Pictures and Indian Paintbrush. At this point, though, we might want to say one almost really good film. You do have to look past the hand-held shots and the constant zooming in and zooming out, as if the camera wanted to be its own character. Luckily the writing and acting are way better than the cinematography. The phone caller asked for Kevin, but there is no Kevin. Just a simple wrong number, or is it? Jeff takes this to be his sign for the day and when he’s off running an errand, he follows strangers named Kevin, signs that say Kevin, and hops on trucks with the name Kevin. One such ill-advised decision leads him to his brother. from Paramount Pictures and Indian Paintbrush. We first meet brother Pat (Ed Helms) when he is having an argument with his wife, Linda (Judy Greer). She thinks they were saving up their money for a house, but he bought something even better! I’ll let you experience that joke for yourself. Jeff finds Pat having a business meeting at a Hooters restaurant. That simple character-defining moment explains so much about Pat, even more about Jeff and his mother that this film really is one of the best comedic character studies available. Jeff and Pat’s mother (Susan Sarandon) has her own story line, but it’s not nearly as good as the story of the brothers. I can’t even imagine a movie where her story would be good. If possible, just ignore her and then we’re back to a really good movie. The plot of the brothers chasing down Linda (and her possibly adulterous acts) and Jeff chasing down things that say Kevin is hilarious and completely entertaining. Even better is that “Jeff, Who Lives at Home” is actually a character study and Jeff is a well-developed, well-realized, completely realistic and sympathetic guy who is only a little less put-together than the rest of us.